Camping amongst the Siberian larches in the glacial moraines of western Mongolia. It could be any glaciated backcountry landscape, but it reminds me most of the western Mackenzie Basin in New Zealand. It’s the sort of view freedom campers enjoy as they van their way around my country’s spectacular South Island, as do those Kiwis with the drive to get out amongst them. A small freshwater tarn forms a natural focal point of the camp. Beyond the tarn, rolling grass-covered moraines and pockets of forest fill the middle distance. Farther back, hill slopes rise to mountains, cloaked with parkland forest. The trees are mostly Larix sibirica, Siberian Larch. Beyond the forested terrain, snow-clad peaks rise to more than 3500 metres. Perversely, the larch is the clincher that most strongly brings me back to the Mackenzie Basin. Siberian Larch is a native in this part of the world, and a close relative of the European larch, commonly found in New Zealand. In New Zealand though, the tree is regarded as a dark alien that invades natural rangelands and displaces native plant species and stock grazing. Despite its negative reputation in some countries, larches are magnificent trees. Even the balmy evening evokes thoughts of home. Not that we get many such things in New Zealand’s central South Island — land of the howling nor’wester — it’s just that those we experience are so deeply memorable. But the weather is not the point today. It’s the cultural landscape I’m taken with. This could be Mackenzie Basin, New Zealand, or maybe it’s western Mongolia? 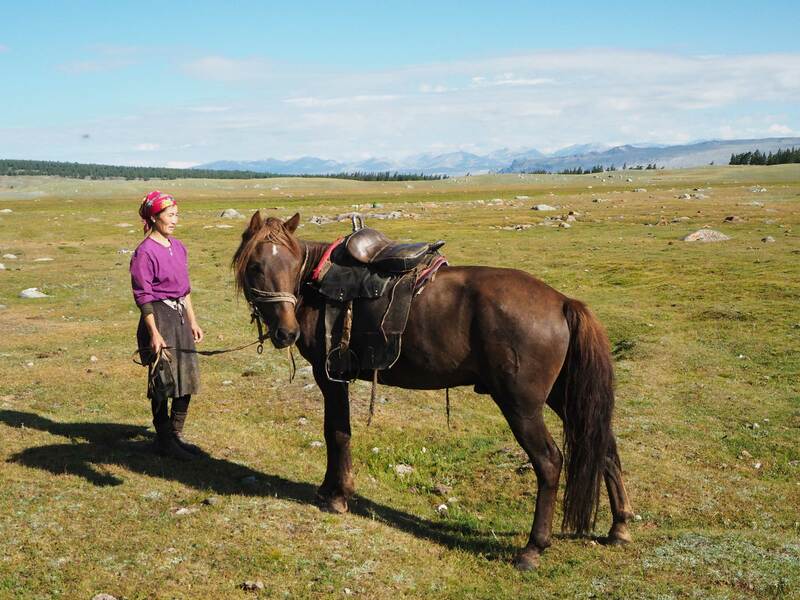 There is no Mongolia without the ubiquitous horse; though there are the occasional truck and motorbike or two in the herder’s camps as well. 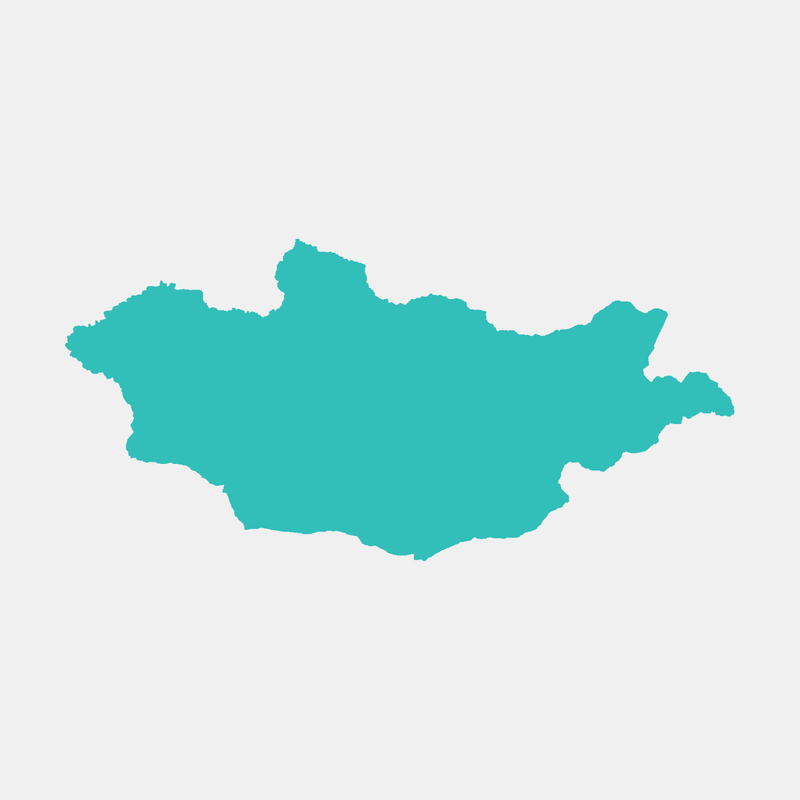 Our tarn is tucked into the beach ridges along the south-western shore of a vastly bigger lake, Khurgan Nuur, the mountains are a sub-range of the Altais, and I’m in western Mongolia. 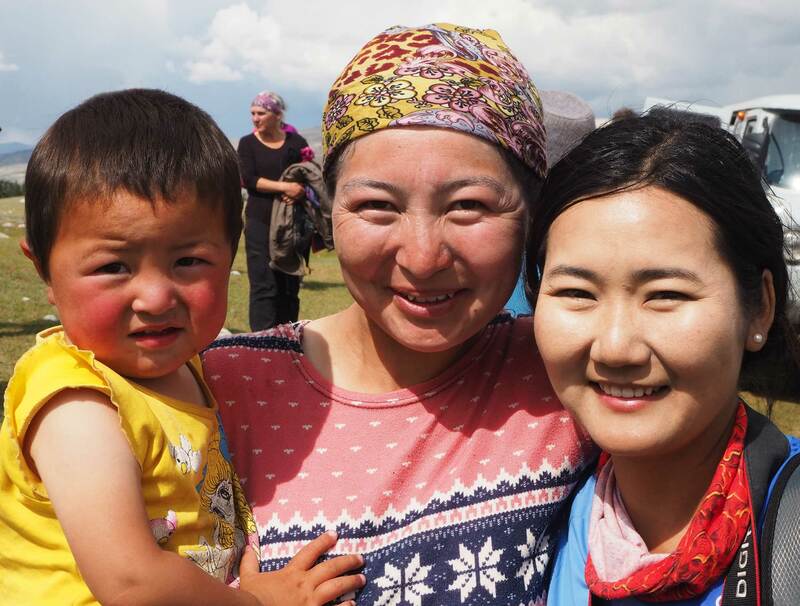 An extended nomadic family of Kazakh is sharing their camp with Anne and me tonight. With our tent up, and signs suggesting the evening meal is some way off, I settle down on one of the flatter glacial rocks to quietly contemplate my surroundings, looking beyond the familiar landscape for any hints of culture that might also be shared. 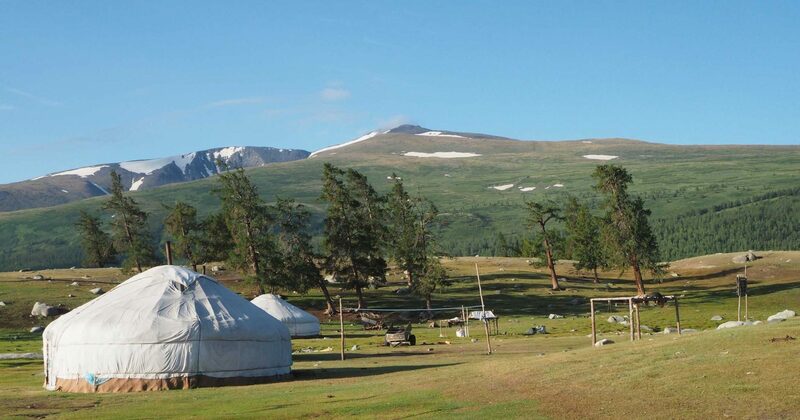 To the left of the tarn, four ger (portable round tents, also known as yurt, favoured by nomads) are lined up at roughly ten-metre spacings. Beside one, our guide Zola chats with a mother holding her baby. Interestingly, two mothers in the camp with babies are married to brothers. Zola the guide, with a host mother and child. Out to the right of the tarn, two small knots of men work away gutting and skinning two freshly-slaughtered goats, slung from larch saplings lashed into an upright frame. Though the men are out of earshot, their pace of work and gesticulations suggest they have plenty of time for idle conversation. Behind me, three young children, roam with a sack, making a happy game of collecting animal dung to power the fireplaces in each ger. In an effective input-output relationship, their play rewards the family with hot, fast and clean heat. I’m surrounded by grazing goats, sheep, cattle and yaks. 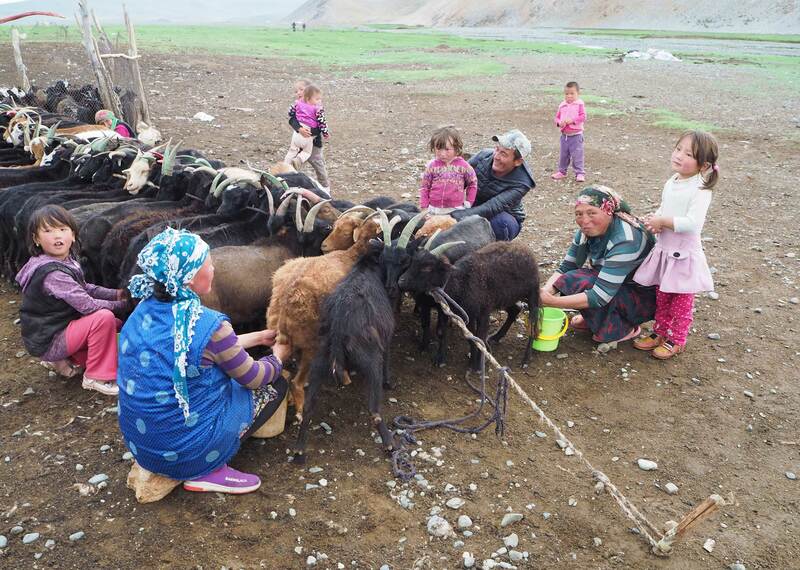 All are prized by the herders as living creatures and also as a source of food, shelter and warmth. Before retreating to my rock, I watched the camp’s women milking the goats — a twice-daily job. All ages lend a hand easing the goats together, then Grandma lines them in a double row and laces them together with a neck harness. Women and youngsters move along the line with buckets, milking each one. Each nanny is left with enough milk to nourish its own kids — the second push of the milking routine. Milking time, a family affair. There are several small but stout Mongolian horses here too, and a couple of dogs. It pays to be mindful of herders’ dogs, which guard the flocks from wolves and other aggressors. But these fellows seem tourist-friendly, they’re bound to have come across the likes of us before. I prefer to play it safe, and we just leave each other alone. Over by the tarn, three tethered eagles sit, looking dejected, but ready to launch when some action or noise arouses them. One of the brothers mentioned earlier trains and exercises these hunting eagles, a tradition that not only persists in the region but is recognised by UNESCO as a World Human Heritage activity. The following morning I’m honoured to hold one of these hunters aloft. From time to time, one of the women emerges from a ger to fill a bucket for the kitchen with water from the tarn. I hope it’s all boiled — ours at least. It’s peaceful here. If a baby cries, it’s not for long and never sounds really distressed. A curious kid goat chews at a frayed guy rope near my feet. 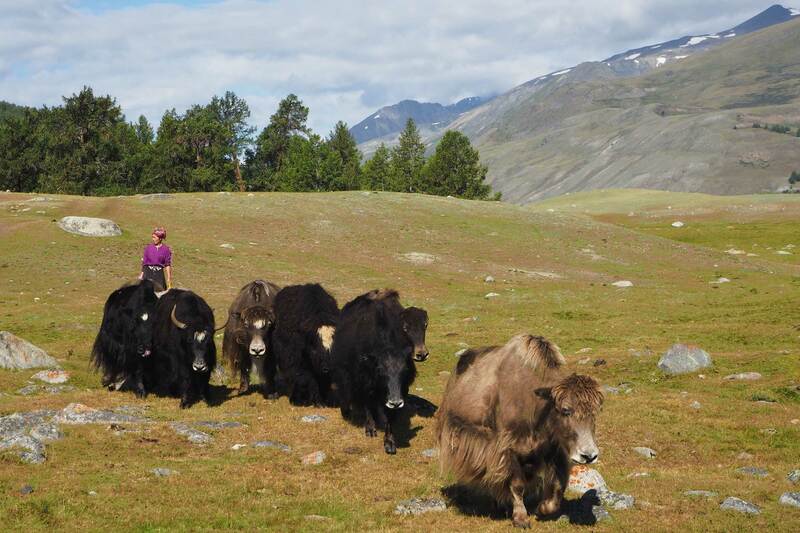 The deep grunt of the yaks carries a considerable distance, yet I really only notice the sound when I listen hard. A dozen or so birds of prey wheel and swoop around camp, often dropping low but never attacking anything. No-one here can name these birds for me, but I think they may be kites. My guess is they’re hanging around for the entrails of the slaughtered goats. But, when the few goodies not destined for some value-added human meal are tossed into a shallow pit, only a couple of birds adjust their flight pattern to check it out. Most unsatisfactory. I expect more raw action than this. The kites must be well fed today. I’m hungry for dinner when called at nine-thirty, though apprehensive. We cluster around a low table at the rear of the ger, we two guests on stools, while the locals balance on their haunches. It’s a convivial, family atmosphere, and light-hearted conversation flows. Zola thoughtfully translates to keep us in on the punch lines — well at least the ones that are not at our expense. It’s a warm and cosy evening in all respects. The family yaks come in for the night. We all dip our fingers into the camp oven, collectively making surprisingly short work of the substantial stew. The intact head of a goat is a staple component of this kind of stew and tonight it rises to the surface, midway through the meal. With the meagre meat from the cheek muscles already sliced off into the pot, the head looks gaunter than I’d prepared myself for. Along with the goat’s head, there are dumplings, and minced entrails encased in intestinal sausage. ‘Waste’ is a redundant concept here, conspicuously absent both within the food stream and beyond it. Apart from a range of excellent home-made dairy products, meat is the nomad’s diet. Green vegetables and fruits are rare, though some say that’s changing as westernisation encroaches. We picked the right season to visit, and fluked a mild day, in what is a harsh and unrelenting environment. Grazing goats and another camp not far from ours. 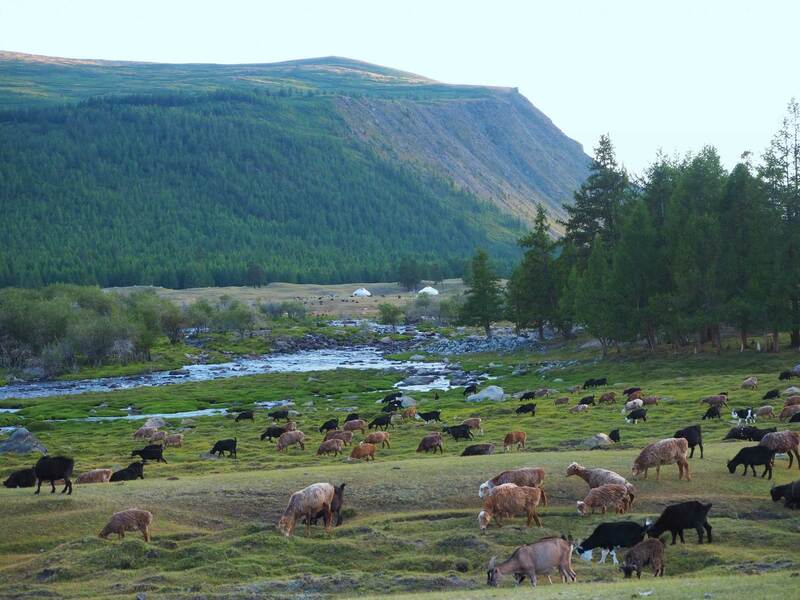 When the weather regimes change, and the pasture runs out, our hosts will pack up every possession, load up their yaks and ‘Russian truck’, and move on to fresh grazing. Usually, it’s more-or-less to where they went at the same time last year. I struggle to grasp the geography of their annual cycle, but some moves may be as few as tens of kilometres, others up to a hundred. Most communities will move four times a year. What is certain, is they’ll be back by the tarn at roughly same time next year. Me, on the other hand, devoid of roots and responsibility, will be moving on tomorrow, pursuing the restless and unfulfilled beat of the time-short, self-seeking nomad. 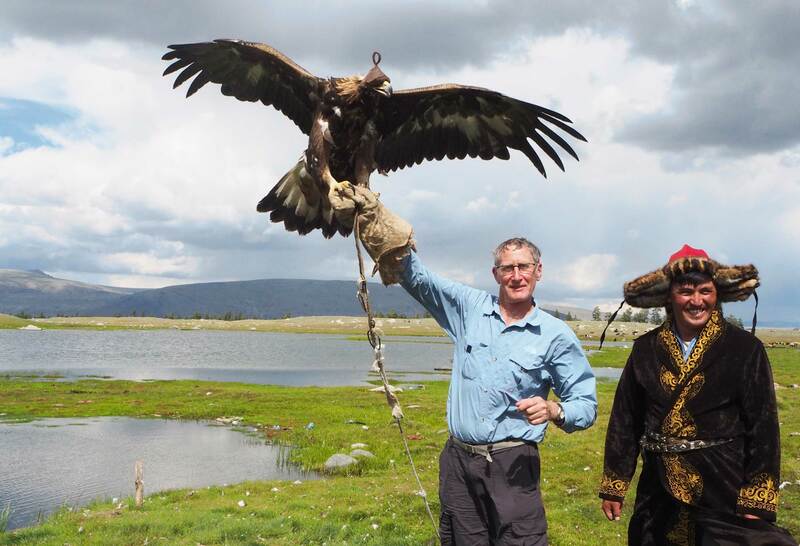 The writer travelled in Mongolia at his own cost with Travel Buddies, a family-based, in-country operator that reaches into every corner of the country from its base in the capital city, Ulaanbaatar.